This stunning necklace by artisan Lai features mini floral silver tone crystals on a sterling silver lobster claw clasp. 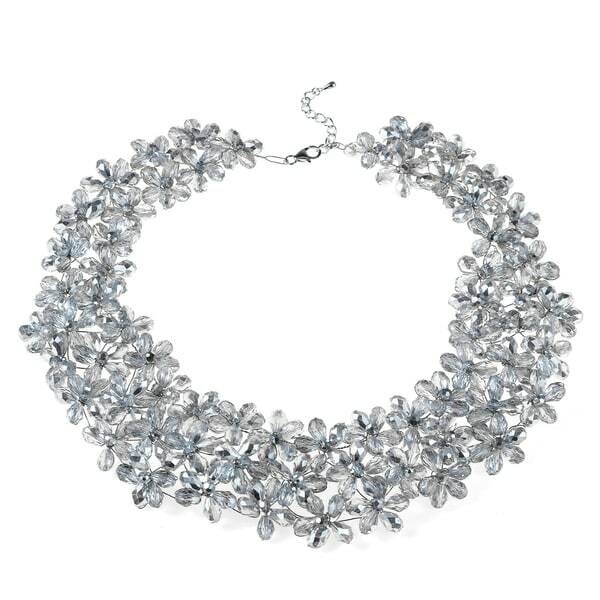 This necklace makes a sweet and elegant statement to your wardrobe. Lai was exposed to the craft of jewelry making at a very early age. By 14, Lai's aptitude and skill had blossomed and she was able to turn her jewelry making talent into a business for her family. Her enchanting floral designs are derived from the natural colors and stone materials found abundantly in Thailand. Her warm personality, creativity, and hard-work have helped her business grow. This necklace is very pretty however I overlooked the fact that it is a choker. I would have liked it more had it been more dangly and come with an extender. It was a bit too wide and busy for wearing as a choker. I sent it back. "Are there matching earrings for this necklace?" Hello norths1, unfortunately no. Please let us know if you have any further questions.